Get the consent of the user for cookies - uncomplicated and according to the GDPR. Cookies are set only after approval, Consent is stored locally and self-assessment is possible at any time. The solution can be used for any web design and any type of cookie. The Gentics Consent Management solution can be used for any online portal. Regardless of which technology or which CMS is used. Gentics Consent Management also offers you the option of requesting consent for cookie clusters - groups of cookies.. You can choose these clusters freely, the type of consent is stored as a cookie on the user's device. In your online portals no data for the user's consent decision is stored. Gentics Consent Management supports operators of online portals in the GDPR compliant collection and storage of consent for the setting of cookies. If a user requires information about his consent decisions, this can be granted by means of a self-service solution. There are no specifications for the user interface of a consent query. Design, structure and logic are freely designable and can be individually adapted to the corporate design of the online portal. Cookie category number, name and content settings can be set as JSON configuration. The user's consent is stored as a cookie on the user's device. Before setting a cookie in an online portal, the consent is requested. 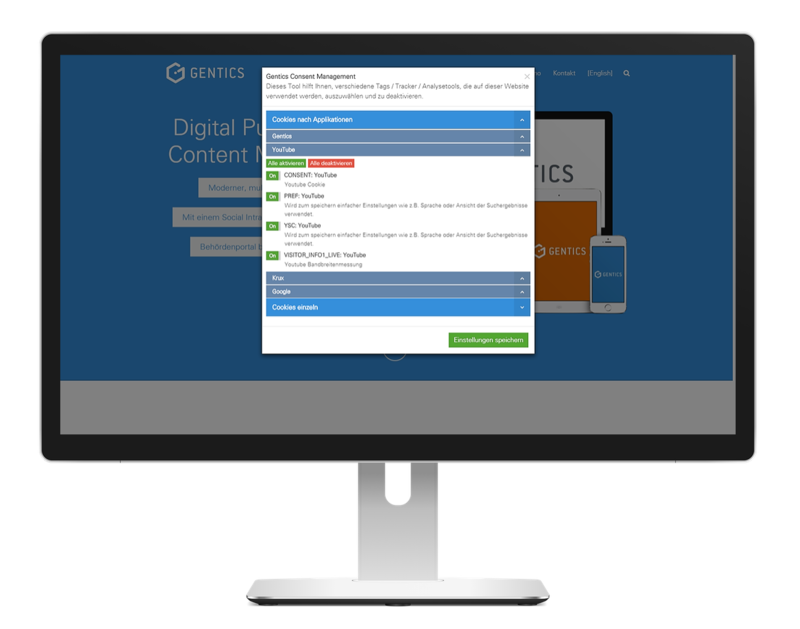 Interested in the Gentics Consent Management solution?